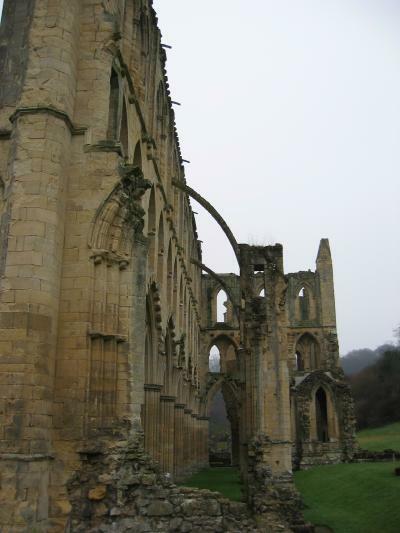 November 22, 2003 we took a trip to Rievaulx Abbey, North Yorkshire. 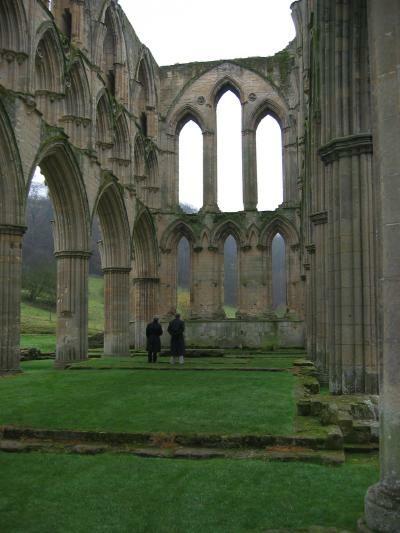 Our friend Sean, who is studying at the other place, met us in Cambridge and then we rented a car and drove to Rievaulx. Driving on the "wrong" side of the road was certainly an adventure, but Paul handled it well. 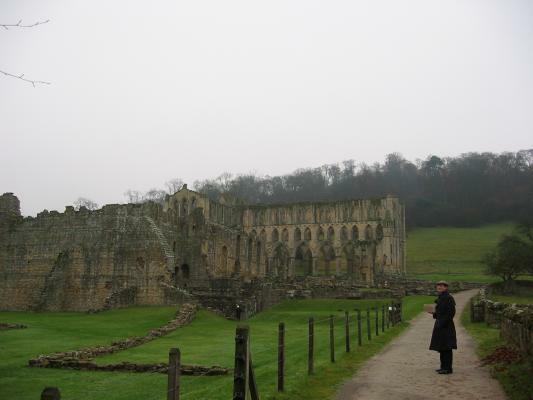 It is difficult to get to Rievaulx using public transportation and this was our first go at renting a car. 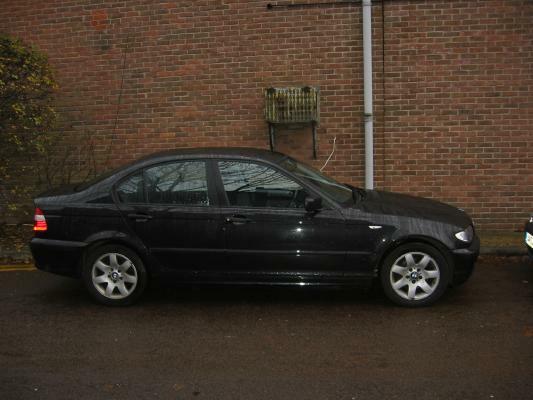 Due to a mistake in the reservations process, we ended up with a BMW! Not a bad deal for us! 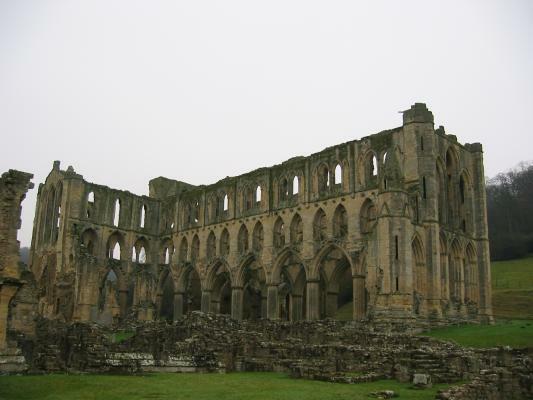 Rievaulx Abbey (pronounced "Reevo") was founded by Cistercians from Clairvaux (in France) in 1131. 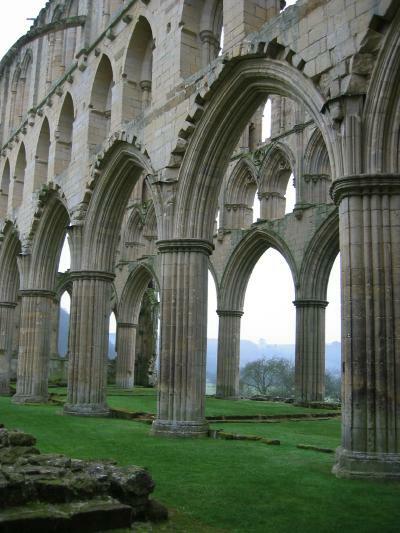 It was suppressed and confiscated by King Henry VIII. 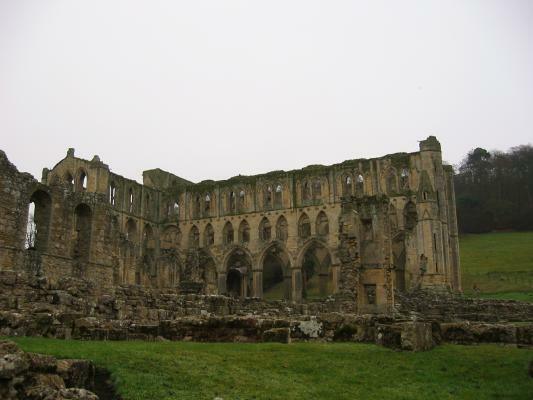 The famous monk and writer, St. Aelred (1109-66), was the third abbot of Rievaulx. 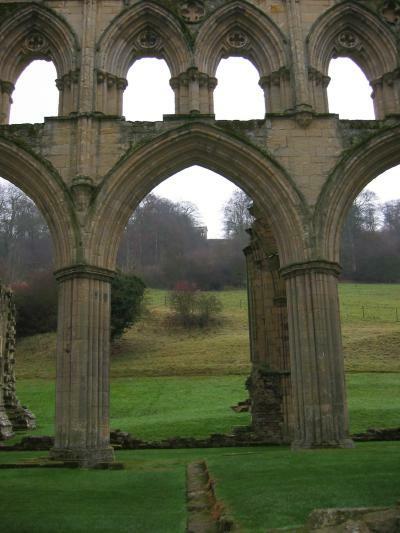 He is known best for his works Mirror of Charity and Spiritual Friendship. 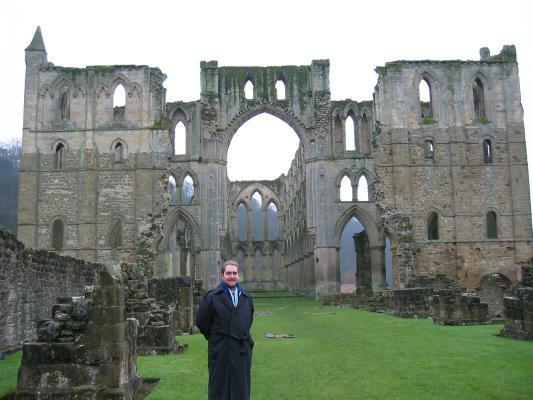 In the spirit of things, we did bring some of Aelred's writings and some of St. Bernard of Clairvaux's writings. 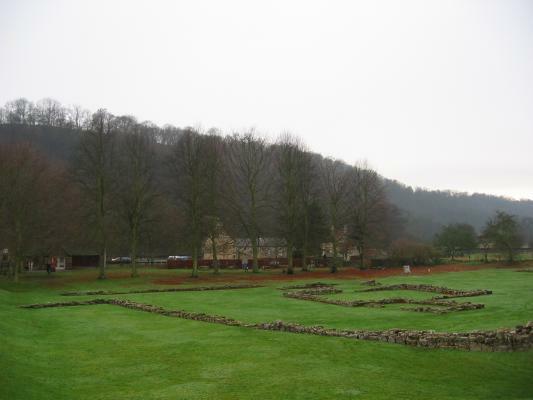 Of course the weather cooperated as usual, which is not at all, but although it rained all the way to Yorkshire from Cambridge, it did stop long enough for us to visit the site. 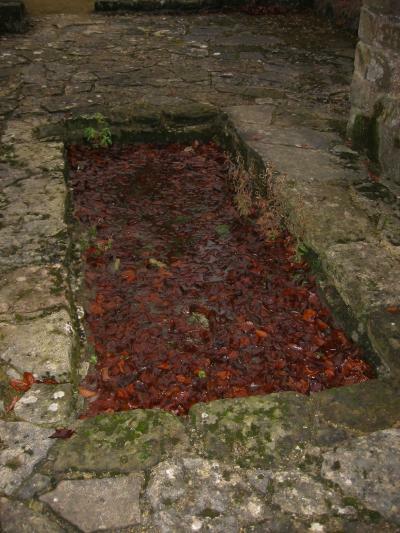 The monks chose this site in the Rye river valley carefully. 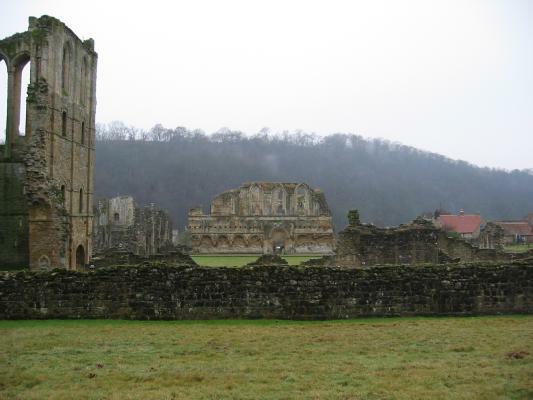 The abbey suddenly looms out of the trees as you turn the corner and it commands the whole valley. Here is the BMW that was "ours" for the weekend. 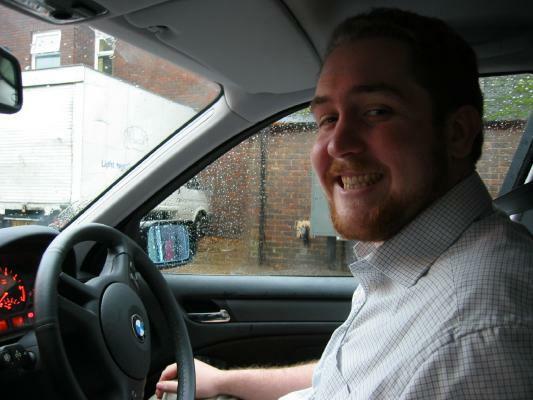 Probably our only chance to drive a BMW! 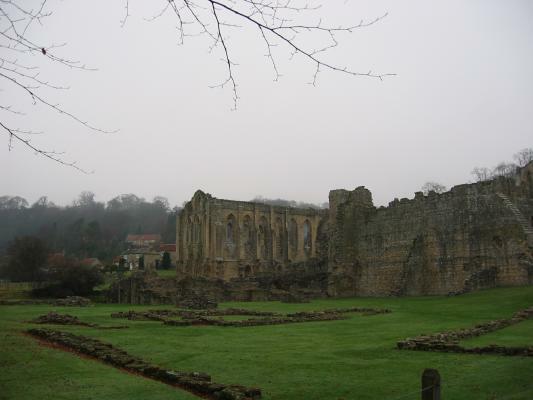 As you walk up the path from the entrance, the abbey suddenly appears through the mist. 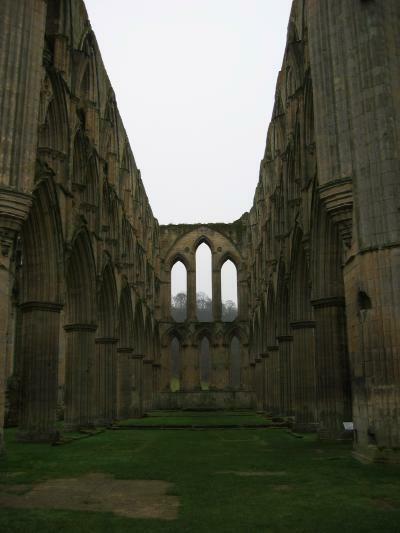 The church, most of which is not the original but added about one hundred years after the abbey's foundation, commands your attention. 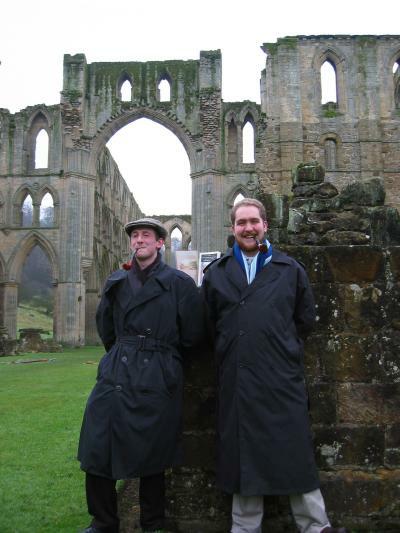 Here Paul and Sean show off not only the abbey church, but also their studiousness. 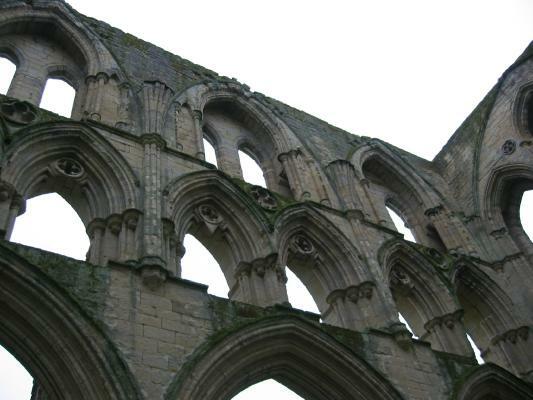 To be honest, I did get a bit "architecture-happy" as far as taking pictures goes. I probably have two times more pictures that I'm not posting up here. 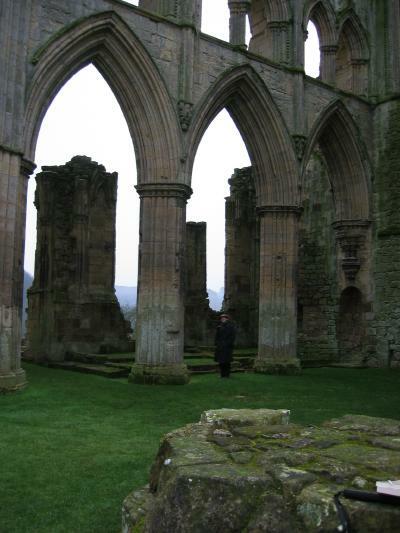 To give you an idea of the size of this church, look at Paul and Sean in the first two pictures; See if you can find them! If you look closely at the last picture, you'll see what looks like a Greek temple on the hill in the center of the picture. 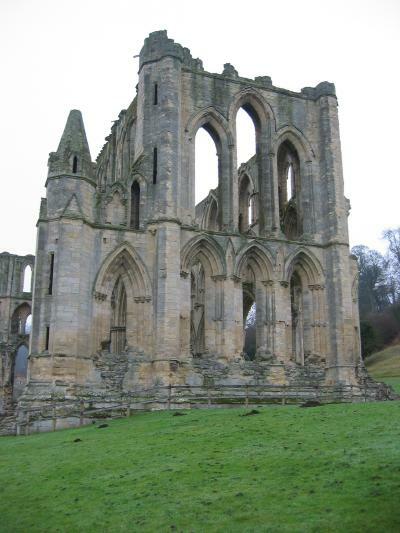 It is actually a "temple" built by the Victorians so that they could sit on the hill and gaze out at the ruined abbey while they sipped their tea. 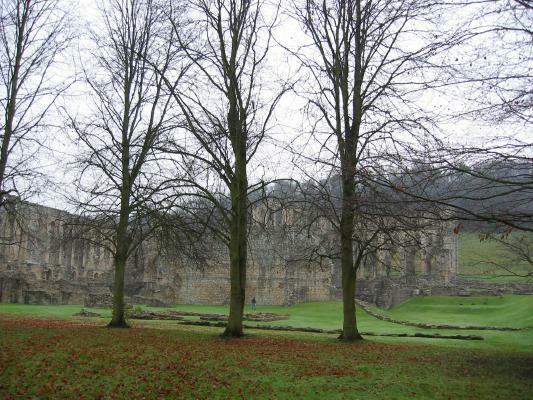 The picture on the left is the cloister. 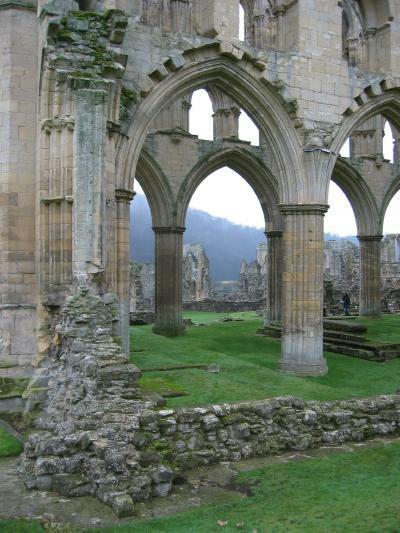 The second picture is the chapter house, where the monks would have listed to the Rule. 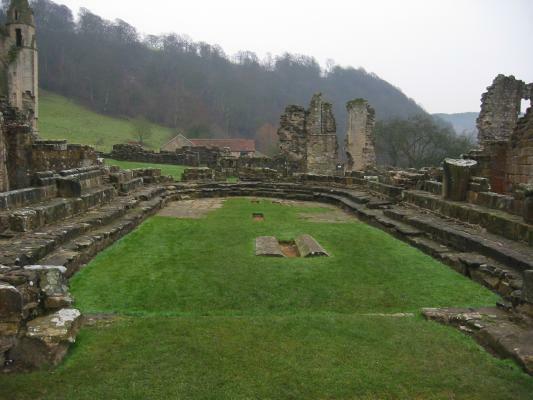 The third picture is of the outside of the refectory (dining hall), across what remains of the original church. 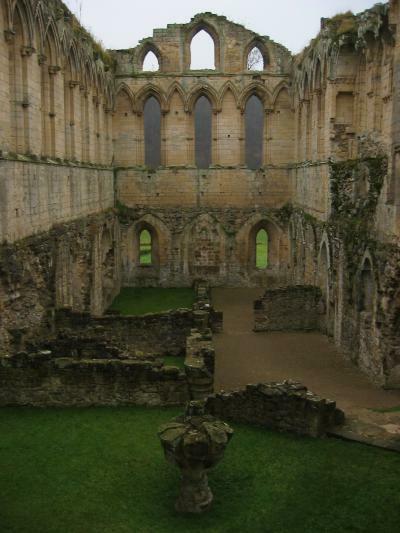 The last picture is the inside of the refectory. It's a bit misleading, because you're actually looking at two levels at once. 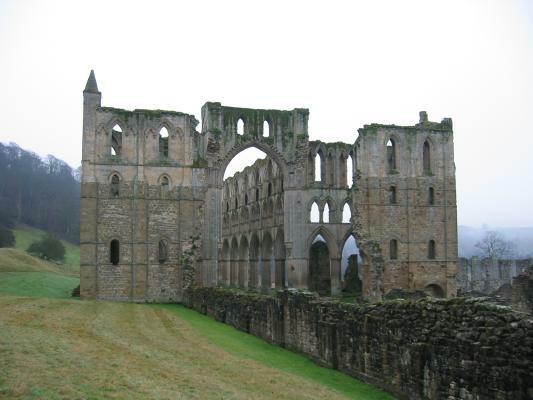 The upper level was the refectory, while the lower level was probably storerooms or a crypt. 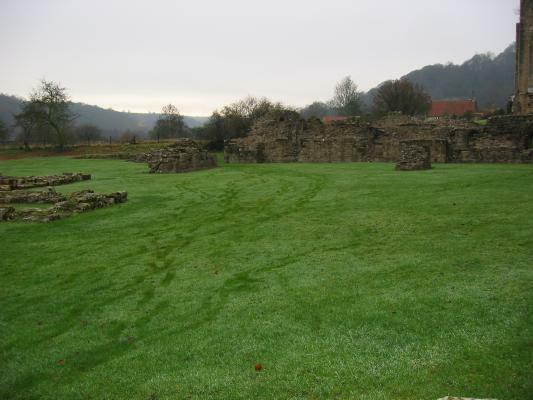 The abbey was very much self-sufficient; these first two pictures are of the abbey's tannery. 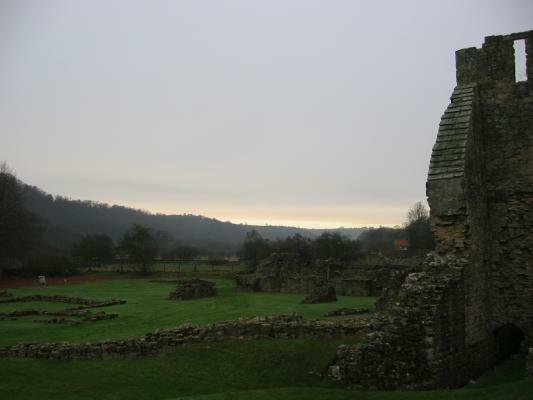 The other pictures are of the Rye valley and other outlying abbey buildings (and the sunset at 3:45pm!). 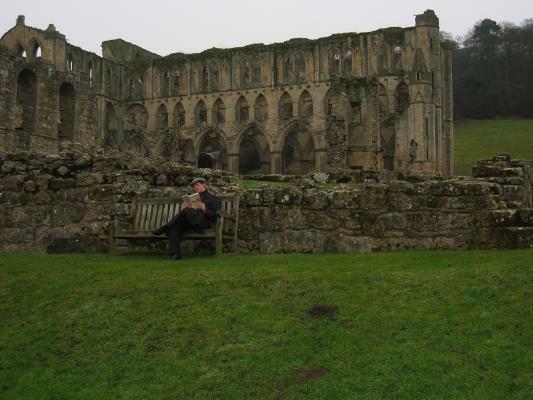 There were only a few other people at the abbey that day (it was a bit cold and damp! ); in this last picture you can see our footprints.